Life is short and uncertain; it is like the fleeting, frail mist of morning that soon vanishes with the rising of the sun. There are no guarantees about today or tomorrow, let alone next year or ten years from now. You may be young and healthy this morning, but you easily could be a corpse by sundown tonight. As Christians we profess to know Christ, and yet we talk and make plans like atheist, never taking into account our own mortality and God’s sovereignty. So today’s prayer then is, “O Lord, make us know our end and what is the extent of our days; let us know how fleeting we are! Teach us then to number our days, that we may present to You a heart of wisdom” (Psalms 39:4; 90:12). 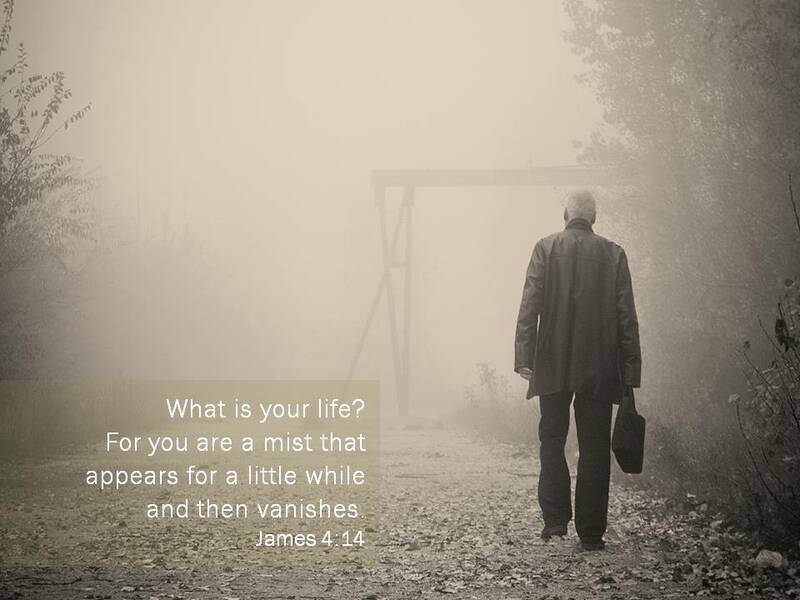 One last thing, where will you spend eternity after the “mist” burns away? It would be my pleasure to help you in your quest to know Christ and follow Him. You can email me at clay@claygentry.com, I’ll be happy to come alongside you on your spiritual journey. Are You A Hearer Who Forgets Or A Doer Who Acts? Are You Teaching For The Right Reasons? ← Are You Teaching For The Right Reasons?